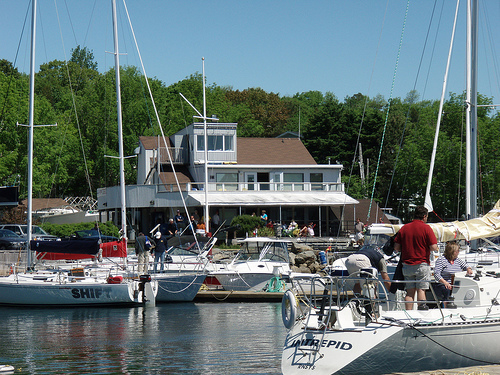 BBYC is a family and community oriented yacht club with an emphasis on sailing, racing and sail training programs for juniors and adults. Cruising coastal for power and sail, day sailing and a variety of events that make up a year-round social calendar place BBYC at the forefront of this vibrant community. We are Bedford’s community based, not-for-profit, volunteer-driven, family-oriented sailing and boating Club. Our mission is to provide a broad range of affordable and sustainable boating services and social functions for members, which support fellowship in sailing, boating, cruising, racing and sail training for juniors and adults. Our clubhouse is available to members and non-members for business functions, social events, parties and weddings. The clubhouse offers a upper wardroom which is serviced by the club bar and is a popular meeting space for club members. The upper level includes a deck overlooking the Bedford basin and marina. The clubhouse lower level includes a dining and social area serviced by the club's kitchen. The lower level includes a sheltered deck overlooking the club's area, and barbeques for casual social events. The clubhouse also offers shower and change facilties for registered visiting yachts, members and guests. If you’re looking for a great location to keep your boat, you've come to the right place. Power or sail, BBYC has both a marina, moorings, dry sail yard and dinghy ramp to suit boats and yachts of all sizes. Tender service runs throughout the day and until dusk during the summer months. Our completely new marina currently has berths available for boats of all sizes including PWC. Club owned marine facilities such as moorings, marina space, dry sail space, and crane launching can be available to visiting vessels. Please contact the General Manager for further information and booking.